The problem of ecology and technological safety become more and more important for the mankind. But the majority of countries of East Europe, South America, Asia and Africa have not enough finances either for environment protection (keeping air and water clean) or for utilization of the accumulated industrial and domestic wastes, or for preventing fires and explosions in industry, woods, etc. The International Center of Practical Ecology and Technological Safety was established to bring solutions to the problems. The problems of ecology and technological safety become more and more important for mankind. But the majority of countries of East Europe, South America, Asia and Africa have not enough finances either for environment protection (keeping air and water clean) or for utilization of the accumulated industrial and domestic wastes, or for preventing fires and explosions in industry, woods, etc. The industrial wastes in these countries (stored in dumps and settling tanks)can be of interest. In the Ukraine there had been accumulated not less than 25 billion tons of such wastes, and the estimates are that they are 2 - 3 trillion tons in the whole world. On the one side such wastes are the source of ecological disaster and on the other side they contain billions of tons of ready residual raw materials: coal, oil products, wood, iron, non-ferrous metals, rare metals, etc. (If, for example, you buy all these dumps in all the above countries 0- and often they are given practically without money - you will become the owners of huge amounts of extremely cheap natural resources that could be compared with the deposits of a big country). 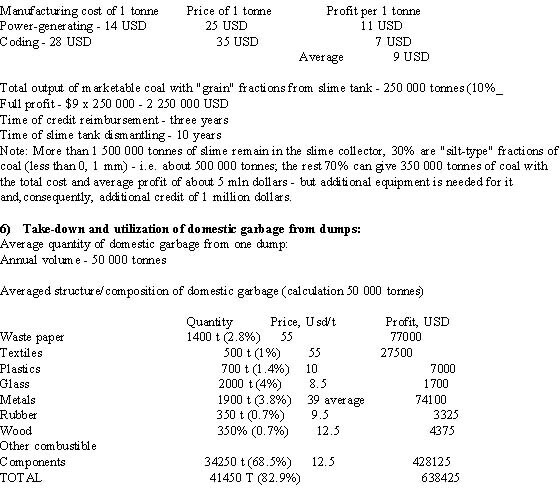 In Ukraine (and Russia) there is a number of rather cheap technologies of utilization of industrial wastes (some of them had been developed by us), the use of which permits to extract raw materials the cost wich is 2 - 5 times less than usual. We have also developed some cheap technologies for extinguishing fires and explosions; small furnaces for burning domestic wastes at a site (without transporting it to other locations); installations for liquidation of local poisonous and radio active impurities, etc. These technologies are designed for non-wealthy countries that have big ecological problems (I have been to Vietnam and understood there that the country needs cheap technologies of wastes' utilization as badly as Ukraine). Perhaps, these technologies are not so perfect or well computerised as American or West European but they are 5 - 10 times as cheap! 1) In this Center all cheap and efficient technologies will be concentrated for: industrial, domestic, poisonous and radio active wastes utilization, technologies of physico-chemical and microbiological purification of ground and water to remove chemical, oil and other impurities; technologies of fighting fires and explosions and other catastrophies: other "ecological" technologies. 2) The Center will either sell its technologies and equipment to the above countries or it will install equipment for the wastes" utlization and then it will dismantle the equipment and take to the other site. The raw materials, or thermal (electrical) power obtained from the wastes, or cleaned ground can be the payment for the above work. 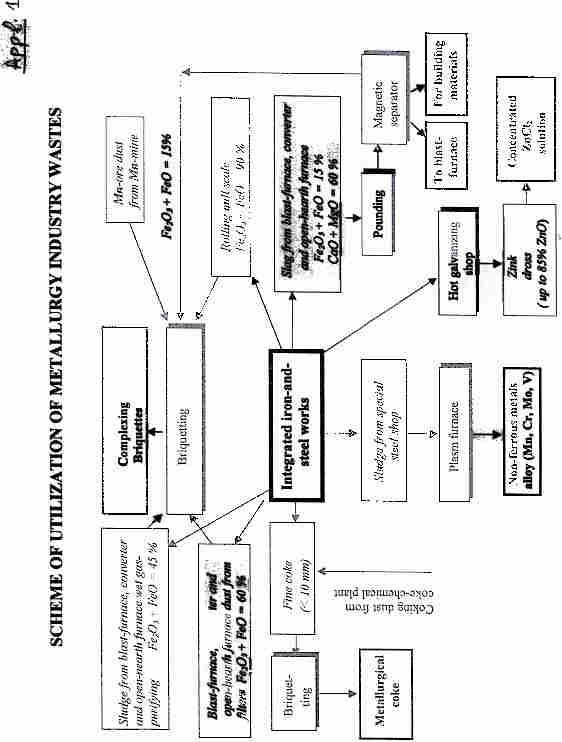 e) extraction of rare and precious metals from industrial flows and from ash of steam electric sytations and the help of new superpower sorbents and also from electronic scrap with the help of modern electrochemical technologies. 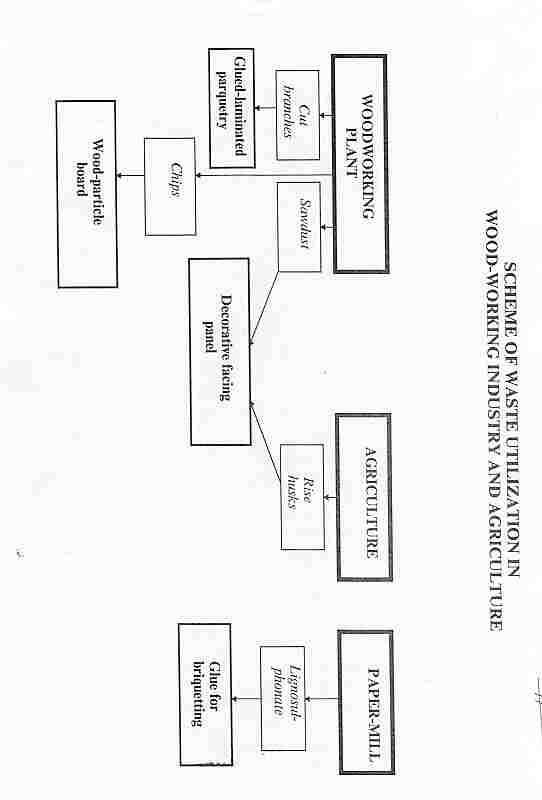 f) Complex utilization of wood working wastes. 2. Manufacture of constructional and finishing materials from the wastes of stone crushing, metallurgic and wood working production (brick, slap brick, pedestrian way plate, foam concrete, wood particle board, parquet). 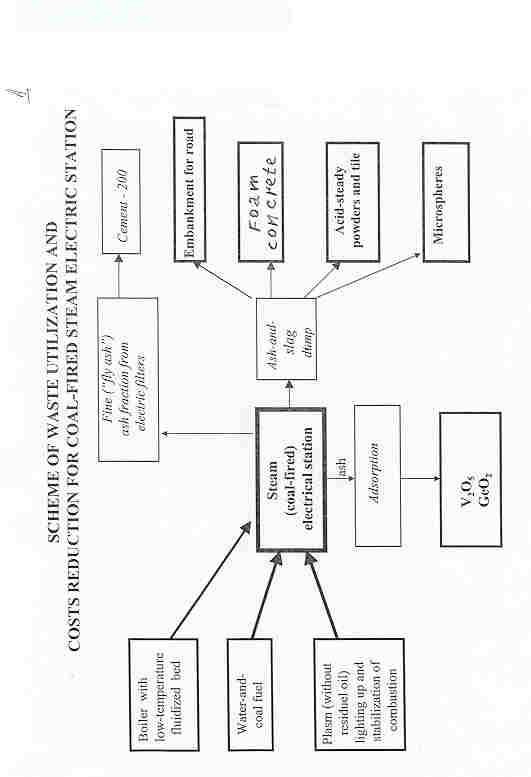 d) landfill of hard toxic and radioactive wastes under special "coat" made of quick-setting foam polymer solution (with a help of foam generator). 5. Fire and explosion protection of industrial installations and means of large fire fighting. APPROXIMATE TECHNICO-ECONOMIC EVALUATION OF THE MAIN DIRECTIONS OF WORK. Time of credit repayment (i.e. time of a waste heap take-down - 18 months (3 months - preparation, 1 year - take-down and transportation, 3 months - recultivation). Use: space apparatuses, submarines, sea platforms for oil extraction, oil-carrying tankers, etc.